Chocolate Hazelnut Macarons are classic chocolate French macarons made with ground hazelnut meal, and filled with a decadent dark chocolate ganache. They're a chocolate lover's dream! Make a template to make piping your macarons the same size much easier. I drew about (20) 1½" circles on a piece of paper, and traced it onto (2) large sheets of parchment paper. Place the parchment paper face down on your baking sheets to prevent pen or pencil from transferring to your macarons! Place the hazelnut meal, cocoa powder, powdered sugar, espresso powder, and salt in the bowl of a food processor and pulse until combined. Sift into a medium bowl. If there is a sizable amount of large bits of hazelnut, process in the food processor until finely ground, and sift into the bowl. When the egg whites are room temperature, add the cream of tartar. Beat on medium speed with the whisk attachment until frothy. Gradually add the granulated sugar while continuing to mix, then increase the speed to medium high and beat until stiff, glossy peaks form. Your whites are done when you dip the wire whip into the whites, turn right side up, and the whites stand straight up. Place the batter in a large piping bag fitted with a large round tip (I used Wilton #806), and pipe onto the circles on your prepared baking sheets. Rap each baking sheet against the counter once to remove any air bubbles, and allow to sit at room temperature for 30-45 minutes to dry out. Position your oven racks to the top and lower thirds of your oven. Preheat the oven to 325 degrees. Bake the macarons for 15-16 minutes, rotating the pans from front to back and top to bottom halfway through baking time. The macarons are done when they just begin to separate from the parchment. Cool completely on a wire rack. Fill with the ganache, and place in an air tight container in the refrigerator overnight to allow the macarons to absorb some of the filling and soften slightly. Fill a large sauté pan halfway full of water and heat over medium heat until the water simmers. Turn the heat down to low, then place the bowl of chocolate chips and cream, stirring constantly with a rubber scraper until the chocolate melts and emulsifies with the cream. When the mixture is smooth, remove from heat and set aside to cool. I traced the bottom of a spice jar to make my templates! Once the macarons have been stored in the refrigerator to meld, bring to room temperature before serving, and store in an air tight container at room temperature for 3-4 days. Ganache can be made ahead and heated briefly to bring to spreadable consistency. Recipe adapted from Hazelnut Macarons from bakingamoment.com and Chocolate Macarons from joyofbaking.com. 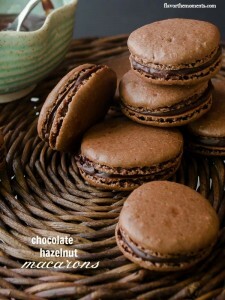 Ganache recipe by Flavor the Moments.